I get a lot of questions, but most of them have already been asked (and answered herein). Please check through these before emailing me. I want to order a _____ sling. Do you have it in stock? I really liked this fabric you used to have. Are you going to get more of it? Why don't you have pictures of finished slings instead of just swatches? How long will it take to get my sling? Will I get a shipping notification and tracking number? I live in Europe, and I don't want to pay the customs fee. Can you mark the sling as a gift? What are loyalty points, and how do I use them? What's this about registration? Should I send in the card? I'm ordering this as a gift, and I want it to be a surprise. As for other features that may not be a direct copy (like padded rails or different shoulder styles), new testing protocols dictate that only carriers that have been tested for both design and fabric can legally be sold, and I have tested only the fabric and shoulder style combinations listed on my site -- I cannot sell anything else unless it's tested to the tune of $350-500 per item. Most slings have a stated weight limit of 35 lbs. Most fabrics and rings will hold much more weight. However, many parents find that by the time their child reaches 35 pounds, the child is more interested in walking than in being held, and that the parent's body is no longer cooperating with a one-shoulder carrier. So while you *can* use a sling for as long as your child and your body will let you, you will probably find yourself reaching for a carrier that goes on two shoulders (a wrap or mei tai) once your child is 25-35 lbs, depending on your physique. 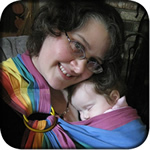 For reference, once my second baby was 3 years old and weighed about 32 lbs, I could still carry him for limited periods (2 hours or so) with a ring sling, but I found a mei tai to be much more comfortable for longer-term wearing. Then again, he rarely wanted to go in the sling by that age, unless he was tired, so my "babywearing muscles" weren't getting the regular workouts they used to! Your child, of course, may vary. I would recommend linen, French twill, or a Tekhni WCRS. Linen is made from flax, an ancient fiber, and wicks away moisture, while breathing nicely through the weave. The French twill is quite lightweight, but not as supportive for very large babies (that is, over 30 lbs or so) or big toddlers as linen or wrap-conversion slings. Both nylon and aluminum rings have been safety tested by their manufacturer, SlingRings, and are made specifically for use in baby slings. Personally, I prefer the look of the aluminum rings -- they are more streamlined and feel more "classy" to me. However, they are a little harder to adjust, due to their smaller gauge; of course, that also means they slip very little, if at all. They do not heat up appreciably when left in the sun, as aluminum has a very low thermal conductivity (they don't retain heat well). The nylon rings have a more baby-sling look to me. They are somewhat easier to adjust with some fabrics, but this also means they are slightly more prone to slippage in thinner fabrics. Only from new, unwashed Tekhni Repreve blend fabrics at the moment, due to testing requirements. Please see the wrap conversion info page for much more information! I want to order a ______ sling. Do you have it in stock? The fabrics shown on the website are currently in stock, as long as the number next to the desired color is greater than zero -- that is, you'll see something like this in the option pull-down: Steel Blue (5). That means I have enough Steel Blue to make 5 slings. If the number is (0), that means it's gone. For tail accents, once it's gone, it's usually gone. Printed fabrics are like books. A certain amount is printed, and when that yardage is used up, it's unlikely to be reprinted unless it's very, very popular. In addition, I tend to buy my accent fabrics on clearance -- they're already at the end of their print run. Occasionally, it is possible to find the prints on eBay or Etsy, but most of the time, when it's gone, I'm unlikely to ever get more. I really liked this particular fabric you used to have. Are you going to get more of it? Due to current regulations, I have phased out all of the non-wholesale fabrics (the ones I can't count on being there the next time I want to order them) in favor of a smaller range of fabric options. Because I sew everything to order, I've usually got just enough time to do the sewing and shipping each day. If I had more time, I could probably take a picture of each sling that I sew, but I'd still need to process each picture and add it to the site, which is not a trivial undertaking with as many fabrics as I offer. I know a lot of the other well-known manufacturers have pictures of completed slings, but their slings are sewn in large batches and (not to put too fine a point on it), they charge a lot more, and some of the price includes things like photography. Not many people realize how much it costs to hire a good photographer and models with babies, and scope out a good shooting location, not to mention cropping and color-correcting the photos once they're taken. What it boils down to is that I'd need to raise my prices in order to include photos of each sling, and I'm just not comfortable raising prices for that reason. I would suggest looking through the photos on my Instagram and Facebook pages -- often, customers post photos wearing their slings. All slings are sewn to your specifications after I receive your order. While I work from home, I prefer to keep regular business hours in deference to my family's needs, so I do not make it a practice to sew or ship on the weekends. I often receive more orders than I can sew in a single day; in that case, I will ship as soon as I can. Generally speaking, orders will go out within 1-2 business days, and after that, it's up to the Post office. I ship via USPS Priority Mail. The PO claims this takes 2-3 days, though your mileage may vary. Californians may find that shipping takes more like 4 days, while those on the East coast may receive their slings within a day of shipping. Whenever I ship a sling, I paste the delivery confirmation (or customs form) number into the order information, and then the cart sends an automated status update letting you know the sling has been sent. However, several large email providers -- including but not limited to Hotmail, Gmail, and Yahoo -- treat all of the automated messages from orders@sleepingbaby.net as spam, and they tend to end up in your spam folder. If you have not received an order confirmation email, it's likely that is in your spam folder, and the shipping notification will probably end up there, too. I recommend adding orders@sleepingbaby.net to your email whitelist (that's a list of "allowed" emails that won't get sent to spam), but you can always check the status of your order by going to "order status" and entering your email address and order number. Please double-check the spelling on your email address when you order; if there are typos, the messages will not go through. I live in Europe, and I don't want to pay the customs handling fee. Can you mark the sling as a gift? No. Marking a purchased item as a gift is mail fraud, and I would be the one breaking the law (and hence, the one who would be punished if the package were opened -- further information is available on the shipping page). I will mark the package with the value of the sling alone (without the shipping costs). The amount you will pay will depend on your country and/or province; if you dislike paying taxes on purchased items, I would suggest contacting your representatives. NB: Because the labeling laws in Canada differ from the US (labels and other printed materials must be bilingual) and Canada requires flammability testing for all textiles (whereas the weights I use for slings is exempt from testing in the US), I will no longer be shipping to Canada. There are lots and lots of terrific seamstresses in Canada, and you will likely find it less expensive to buy in-country anyway -- though I am sorry for the change. My cart now allows you to accumulate loyalty points when you're logged into your account. Each time you place an order, you earn 5% on the dollar value of your purchase (not including shipping). So if you buy a linen sling for $50, your 50 loyalty points are good for a $2.50 discount the next time you order. If you haven't made an account (and unfortunately, it's not automatic -- you have to create one separately from filling in the information at checkout; perhaps the cart designers will change that with the next update), you can create one and email me to let me know you've done so, and I will retroactively attach any credits you've earned in previous orders. (Please use the same email address for the account that you've used for your previous orders -- that's how the cart links the orders to the account.) You can either use your points each time you order, or save them up and use them all at once; it's up to you. I'm afraid I can't give refunds on current orders based on retroactively-attached credits. With the passage of the CPSIA (Consumer Product Safety Improvement Act) in 2011 came the mandatory inclusion of a post-paid registration card attached to every baby item, no matter how small the company. I already have complete records of each purchase, but that is not legally sufficient. I attach a registration card to each sling, as I am required to do. HOWEVER, because the cards must be post-paid, and that requires a costly permit from the US Postal Service, the cards are not actually free for me to receive -- that's what "postage paid by addressee" means. I pay at least $1.20 per card that is returned, which means I have to account for that fee in my prices. If people just register online, it's basically free for me, but the cards mean I will have to increase my prices if too many people use them. Please, please register online if you're going to register! It's here. Please understand that the 15% restocking fee is added not because I want to be difficult or take your money, but because as a very very very small business, every moment and every dollar counts. I know it's nice to have a surprise gift, but a sling is a pretty personal item. I think it's best to let the recipient pick out the size, color, and other options -- pockets, rings, etc. Returns and exchanges are possible, but difficult. I think it's better to get it right the first time, even if that means spoiling the surprise. I offer gift certificates, which might be a better option for you.